Post about a topic being learned or explored. May contain resources. 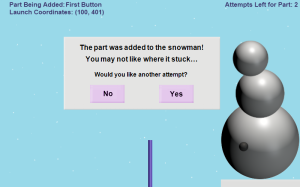 It’s been a while, but @lace_fire here again with an update to one of previous games, Snowman Day! I’ve tweaked a few of the game’s features to improve the game-play and hope I’ve been successful. Throughout the 2016 year I plan to finish the five remaining unfinished games that I submitted for #1GAM. This past weekend I attended an Indie Arcade event and was happy to verify that Blender and Unity are two software applications some indie game developers use when creating games. Though all of the games created for my year participation in #1GAM were created with Phaser, I do intend to learn Unity once I have completed these games.